The inquiry report provides a chronology of 40 Don River flood events during both ice-jam and ice-free conditions dating back to spring 1801 when aboriginals could not spear fish for salmon due to the post-flood high turbidity levels. Railway line damage and flooding during ice-free conditions (i.e., no ice blockage of bridges) was reported in the "Great Flood" on September 13, 1878, the spring of 1914, and during two storms in 1980 (March and April). Limited flooding was also reported on May 11, 1981 including the area of the Bayview Extension and the Toronto Brick Yards - the stranded GO Train incident occurred was just south-west of the Brick Yards (now the Evergreen Brick Works). The report indicates that train operation has halted, or trains were detoured during floods, including December 25, 1979, January 11, 1980, March 21, 1980, April 14, 1980, February 11, 1981 and May 11, 1981. Example historical flooding in vicinity of stranded GO Train during July 8, 2013 flood (report Table 1). During the March 21, 1980 flood "Part of the CNR track flooded to the north and east of a point south of Bloor Street." The 20 hour low intensity spring storm produced high runoff as ground in the watershed was partly saturated and frozen. This area north of Bloor Street corresponds to the location of the July 8, 2013 Go Train flood. During the April 14, 1980 flood, after a 5-6 hour period of rain, CNR tracks at the Bloor Street ramp were flooded. The GO Train was stranded just east of where the Bloor Street ramp connects to the Bayview Ave. Train operation was halted or detoured during previous Don River floods. Today, development in the Don River Watershed is greater, meaning more runoff into the Don River and a greater flood potential. While stormwater management controls in a small portion of the watershed have controlled local peak runoff since the early 1980's, these measures do not control runoff volumes. Consequently, despite early runoff control efforts, the cumulative impact of runoff volumes have been recognized as factor affecting increased flooding during extreme rainfall (not to mention erosion during frequent rainfall). "The report notes that extreme weather associated with climate change has already damaged the province’s infrastructure; for example, intense storms and flash floods in recent years have caused costly damage to provincial roadways and commuter rail lines." As long-term rainfall intensities have not increased in Toronto, it must be acknowledged (as in the 1981 inquiry) that causes of the Metrolinx GO Train area flooding includes i) watershed characteristics that influence the rainfall-runoff process, and ii) hydraulic capacity drainage system including dredging frequency and extent. Dredging influences were explored in the Keating Channel Environmental Assessment by Acres Consulting, 1983. Other more recent changes to the Low Don system hydraulic capacity include the West Don Lands landform / berm that restricts flow in former "Spill Area 3" downstream of the rail lines. Watershed hydrologic characteristics resulting in a higher peak flow for a given (existing) rainfall, as well as development in flood prone areas, cited in Environmental Assessment as contributors to long term flooding on the Low Don River (Acres Consulting, 1983). Storm Intensity Not Increasing. Review of Weather Event Statement in Insurance Bureau of Canada’s “Telling the Weather Story” prepared by Institute for Catastrophic Loss Reduction. Environment Canada analysis and engineering dataset review for Canada and Ontario, July, 2015. "Old extremes are the new normal". As illustrated through these slides, Telling the Weather Story makes a statement on the increased frequency of storms and weather events, indicating that in parts of Canada, events that occurred every 40 years are occurring every 6 years, due to climate change. The statement on increased frequency is unfounded as (based on ICLR's IPCC source and material and IBC's presentation to the Empire Club of Canada) it is based on a theoretical shift in temperature frequency from a global climate change report, and is contrary to Environment Canada’s actual analysis and data on local rainfall intensity trends. The Telling the Weather Story statement on increased storm intensity, based on temperature theory has been i) embraced as rainfall facts and research by many organizations, ii) embellished to apply to extreme rainfall, and iii) considered in policy and economic reports. Organizations promoting the misinformation in the statement include TD Economics, The Toronto Star / thestar.com, CBC News, Canadian Chamber of Commerce, Columbia Institute Centre for Civic Governance, Civic Action, CBC Doc Zone, The Calgary Sun, CanadianUnderwriter.ca, Aviva Canada, Insurance Bureau of Canada. Due to the unfounded Telling the Weather Story Weather Story statement, policies and efforts toward mitigating increasing urban flood damages may be misdirected to climate change mitigation, as opposed to more effective risk identification/management efforts, urban planning / stormwater management policies and infrastructure remediation / capital investment efforts that address the root causes of increased damages, not related to theoretical storm frequency shifts. 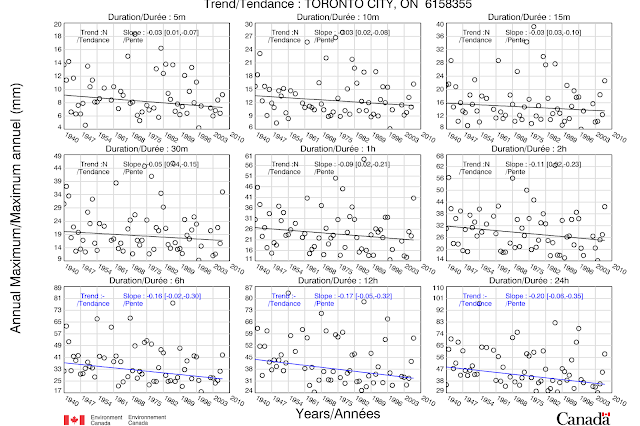 Long term Toronto rainfall intensities decreasing per Environment Canada data (5 minute to 24 hour storm durations).